BusinessMAP's included data and functionality continue to make it an outstanding desktop mapping value. Version 5.0 includes updated business listings from Dun & Bradstreet (D&B), integration with Google Earth and Google Maps, and the capability to place geo-referenced photos on the map. This review covers the Google Maps compatibility, custom territory creation, geo-referencing photos and appending lat/longs to the database. BusinessMap 5.0 now allows you to combine and exchange data with Google Earth/Maps via KML files. This function lets you import points and polygons from Google Earth, and export points and territories from BusinessMAP to Google Earth or Google Maps. This new function in BusinessMAP is very simple to use. 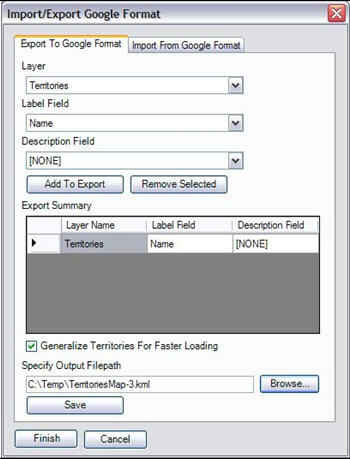 I created some dummy territories in BusinessMAP by aggregating several counties in Georgia so that I would have boundary files to export to Google. They looked like this (Figure 1). Then I clicked on the Google icon on the toolbar (Figure 2). The dialog below appeared (Figure 3). In the dialog, I selected my territories layer, the field I wanted as the label and a description. Next I opened Google Earth and loaded the file I had created. I adjusted the file properties in Google so that my territories would stand out. This is what they looked like this (Figure 4). If you use the File - Save function while in Google Earth, and then save it as a KML file you can import that file into BusinessMAP (Figure 5). 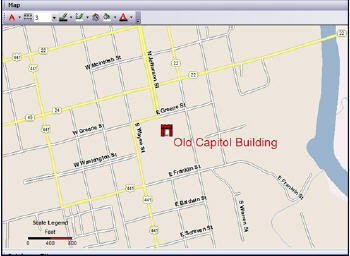 In this case, I used the location of the Old Capitol Building in Milledgeville, GA. I located it in Google Earth, established a Pushpin there and used the Save function to create a KML file. To bring that file into BusinessMAP, I clicked on the Google icon in the toolbar just like I did using Google Export, and then clicked on the Google Import tab in the dialog box that appeared. 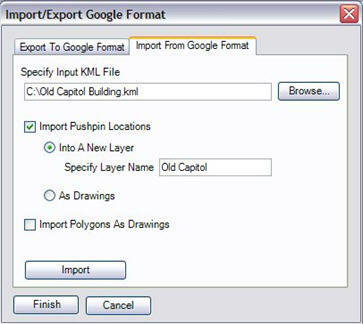 In the Import/Export Google Format dialog, I located the file to import, noted the type (Pushpin or polygon - lines are an option, too) in the Import/Export dialog, entered the layer name, clicked Import, and then clicked Finish (Figure 6). The Old Capital Building showed right up on my map. Pretty straight forward and easy to do. Note that I found a symbol that looks like the Old Capitol building (Figure 7). Sometimes you want to create a custom territory "freehand. "A new function in BusinessMAP allows you to do that. 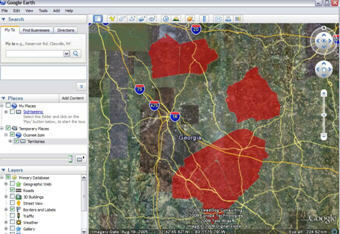 First, I used the drawing tools to create a polygon on the map around Atlanta. Note the shape (Figure 8 and 9). Then I clicked on the tool bar (the tool tips say Add Attributes to Polygons). The dialog appeared, and I used the Edit pulldown to click the Add Drawings choice. After I clicked on Add Drawings, a row for that polygon appeared in the polygon table. Then I clicked on Define Columns and edited columns by name and content. I then saved my new territory using the File - Save pulldown in the Polygon Table, which I had to do before I could use the Analysis function. It can be saved as an XML or KML file. One of the helpful things about this capability is that not only does it allow you a great deal of flexibility in creating territories, there is also some analysis not usually found in this type of product. 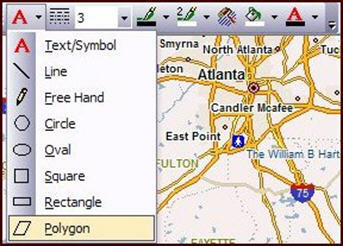 In the Polygons table I clicked Analysis and got the dialog below to access advanced spatial analytical choices, with Center Inside, Completely Inside and Intersect. The dialog let me specify how I wanted to search through my polygon and which layer I wanted to use for the results. In this case, I used cities completely inside my polygon. The results showed those cities (table is truncated) in the database window (Figure 10). I found the ability to edit the latitude and longitude of geocoded points very useful. When you import your own addresses to be mapped, most desktop mapping products I've used in the past will usually geocode them and display them on the map in "black box" mode. In BusinessMap 5.0, you actually get to see the lat/longs that were derived in your database. No matter how good the geocoding engine is, it will invariably put some of your points not quite where they are in the real world. Being able to "adjust" the lat/longs gives you the precise placement option. I'll illustrate this with a map of Texas and a sample database called Hotels.dbf. From these I created a Texas subset and saved it as Hotels-Testdatabase.dbf. Next I loaded it as a new database. The Add Database Wizard provides geocoding options. I picked "by address." I was then asked to verify the fields (Label, Address, Zip, etc. ), and I was shown symbols to be used. Then the geocoding begins. When I clicked on Database - Edit Database, the table appeared with the lat/longs (Figure 11). All the fields are, at this point, editable. At the top of the table are two pulldowns, File and Database. Under Database is Create, which adds the table to the map legend. Under File is Save As, which let me save this as a new file with my edits and the lat/longs. In this case, I saved it as Hotels-Testdatabase-geo-coded.dbf. I had the choice of saving the file in .dbf, .xls or .mdb format. After it is saved, under the Database pulldown there is now a Refresh option which redraws the data on the map. Note that as a .dbf file, it can be edited within BusinessMAP and saved without the hassle of trying to edit in some other .dbf editor. 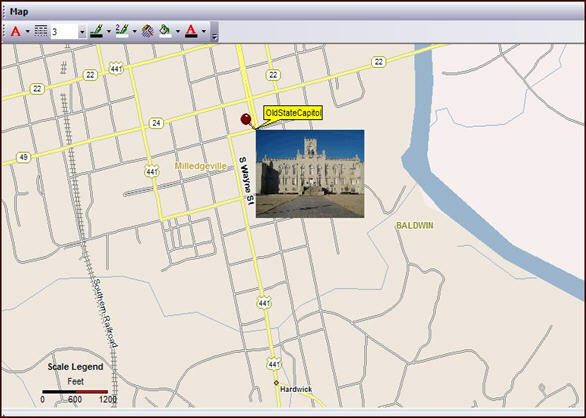 For those of you who have the ability to capture a lat/long with the photos in your digital camera or cell phone, BusinessMap provides a very slick way to put those photos into a map. I chose to try it with a standard digital camera. On the toolbar when you click the camera icon, you get the Windows dialogue for opening files (truncated dialogue). After you locate the picture on your computer, if it is geo-referenced, it will load and place itself on the map. If it is not geo-referenced, you get this dialog which gives you an opportunity to geo-reference the file. When you click Yes, a Wizard will appear, allowing you to enter the address associated with the photo. This is a photo of the original State House of Georgia, when the capitol of Georgia was in Milledgeville (pre-1865). Not only does the photo appear on this map where I address-matched it, but it is now geo-referenced so I can use it with other maps (Figure 12). BusinessMAP automatically creates a companion file to your image (same file name, different extension) that contains the geo-referenced information. BusinessMAP 5.0 continues to be a versatile, functional product at an affordable price. The data including the D&B business listings are extensive. The ability to interact with Google Earth and Google Maps makes the product contemporary and flexible. Being able to edit lat/longs for your data from within the product is, I think, a particular plus. BusinessMap contains most of the desired business mapping functionality including demographics, drive times, ring studies, spider maps and territories, and it even has the ability to do spatial calculations with geographies.